“The El Paso Border Patrol sector has temporarily closed its system of highway checkpoints as it struggles to cope with a record influx of families crossing the border and requesting asylum,” Texas Monthly reported on Saturday. The magazine stated that sector officials are moving the agents that would normally staff the checkpoints to the border to assist with transporting and processing the overwhelming number of migrants illegally crossing the border. In response, it appears the agency is shutting down the inland immigration checkpoints that normally stop many of the drug and human smuggling activities missed at the border. 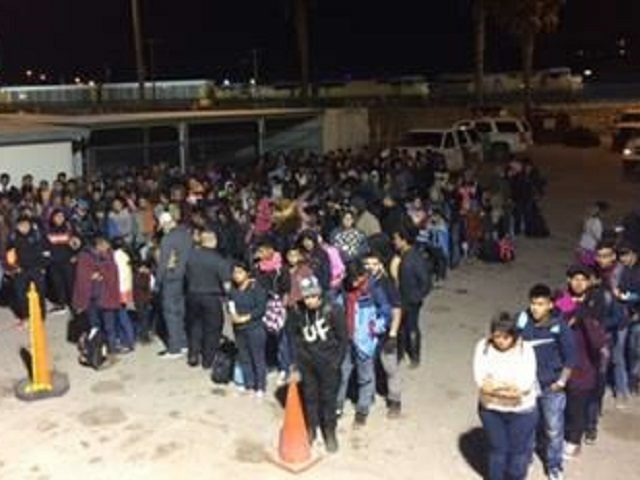 During the first five months of Fiscal Year 2019 (which began on October 1, 2018) El Paso Sector officials reported a 1,689 percent increase in the number of Family Unit Aliens apprehended in the sector, according to the February Southwest Border Migration Report. In February alone, the agents apprehended 13,744 migrants including 10,509 family units and 1,517 unaccompanied minors. Texas Monthly reported that the Border Patrol checkpoint located on U.S. Highway 62/180 is closed and that the checkpoint lanes are blocked by orange cones. Several other checkpoints in far West Texas and southern New Mexico appeared the same way. Breitbart News reached out to U.S. Customs and Border Protection officials for confirmation and more information about the reported closings. An immediate response was not available. U.S. Representative Henry Cuellar (D-TX) reportedly confirmed the closures to Texas Monthly, saying, “We’re seeing an impact on the traditional work Border Patrol and CBP do to handle the large number of asylum cases,” the Texas congressman stated. He went on to say the U.S. government is working with Mexico and other Central American countries to “fend off the flow if migration from Central America,” the magazine reported. These inland Border Patrol checkpoints play a vital role in reducing the flow of illicit drugs and illegal aliens smuggling activities that are missed at the border. Without these checkpoints, migrants are placed in additional danger as human smugglers will feel free to pack them unsafely into cars, trucks, and 18 wheelers.